The Senior High Youth Group at First Church is led by our Coordinator of Youth Mission Trips, Trish Walton. The group is made up of kids both from inside our church and around our community in grades 9-12. 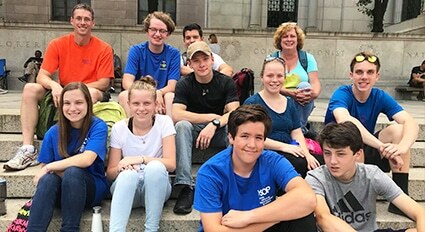 The Senior High Youth Group typically makes two mission trips a year, one in the summer and one on a spring weekend. There are various fundraising activates for these mission trips during the year. For information about the SHYG, please contact Trish Walton. 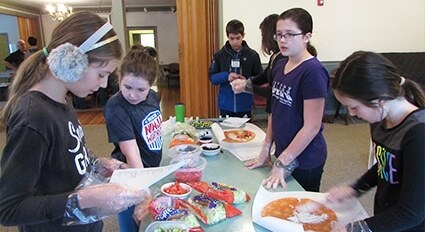 The Junior High Youth Group welcomes young people in grades 5-8, and they meet once a month. Activities include service projects, fun and fellowship gatherings, local outings, and fundraisers. This group is led by Matthew and Marla Walsh.